I just returned from three blissful, adventurous and unforgettable days with my family in the Katahdin Region of Maine. 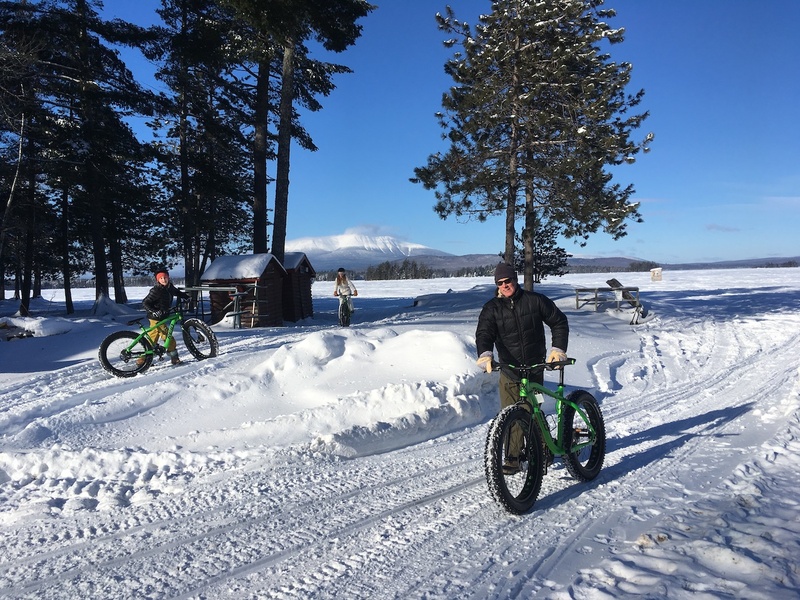 It’s hard to explain just how refreshed, renewed, and revived we feel after busting our butts on fat bikes, skiing on miles of cross-country ski trails, and even jumping on a snowmobile for a cruise across Millinocket Lake. The thing is that we didn’t rough it. 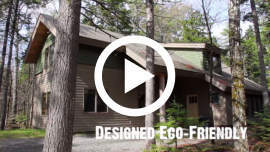 We stayed at the New England Outdoor Center, a beautiful resort just 8 miles north of Millinocket. 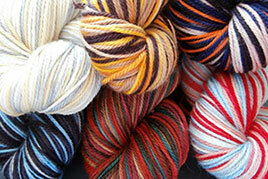 The good folks at NEOC make life in the Great White North both a comfort and a joy. 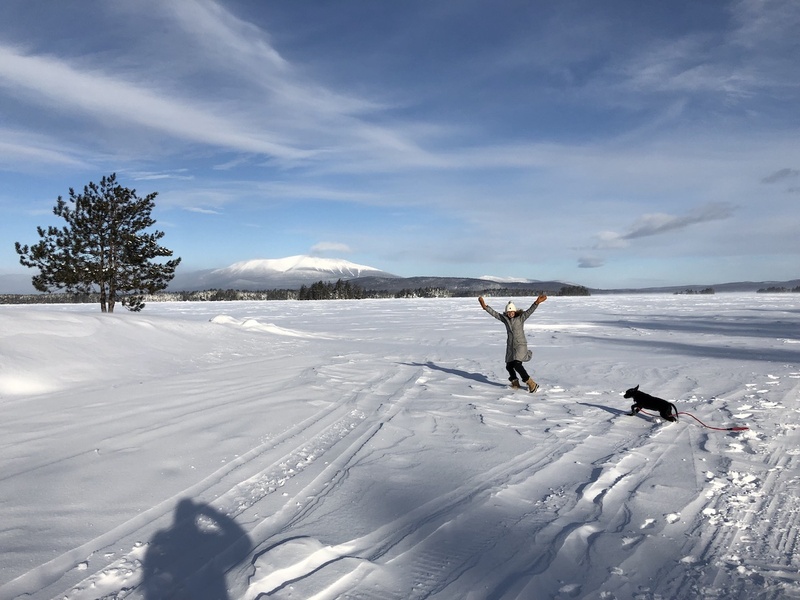 Here are our top five reasons why the Katahdin region is a must-visit for families in winter. The Mountain. Arriving at NEOC, the very first thing you notice is stunning snowcapped Katahdin. This 5,267-foot mountain looms directly across Millinocket Lake like a majestic, unblemished Temple to the Deities. For anyone who grew up in New England, this iconic wilderness mountain — with its Baxter, South, Pamola, and Hamlin peaks and its infamous Knife Edge – is the stuff of legends. In winter, the mountain has a resplendent and humbling quality that renders one speechless. If you’ve hiked Katahdin, you have even more kinship with its thrusts, crevasses and contours. For three days, we simply stared at Katahdin in amazement. We took photographs of it, we skied under it, we dined under it, we were mesmerized by it, and so was everyone else at the resort. A Night Sky Like You Dream About. Perched on the border of 209,644-acre Baxter State Park and the newly formed 87,563-acre Katahdin Woods and Waters National Monument, there is simply no light pollution anywhere near NEOC. In fact, Maine contains the largest light-pollution-free area in the eastern half of the United States, and some Katahdin area visionaries are spearheading a movement to make Maine a dark-sky destination. At twilight, the skies faded to dark blue, and when night fell, a velvety darkness blanketed the sky bringing forth a magnificent mantel of stars. Dark skies are like medicine for the soul, providing a deep sense of calm, quiet and beauty like nothing else. Moreover, it confirms that you are in wilderness. 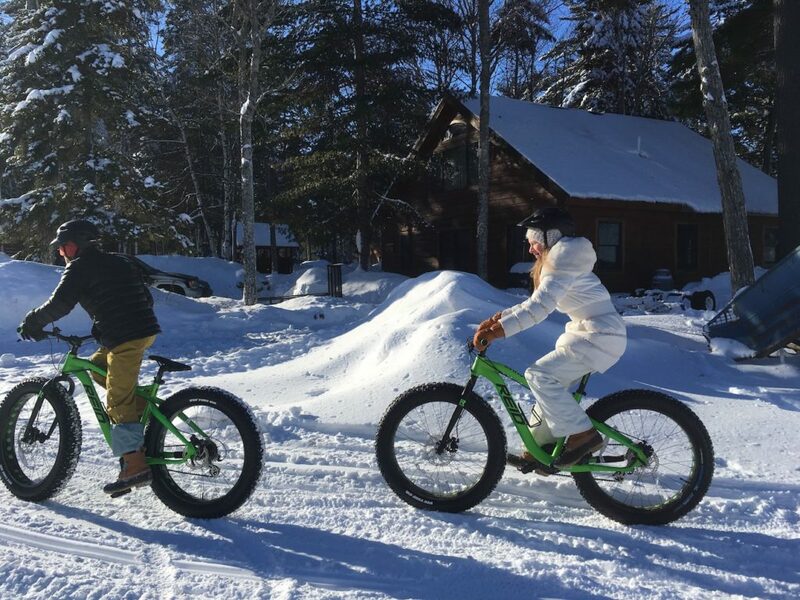 Fat Biking. To be honest, I went north for the fat biking. I’d heard that NEOC invested in Fat Bikes and I needed to try it. So, under clear bright skies and cold temperatures, five of us climbed on fat bikes and took a ride over to Ambejejus Lake. Within minutes we were warm, comfortable, and exhilarated. The riding was pretty easy, not too different from a road bike, and fun! 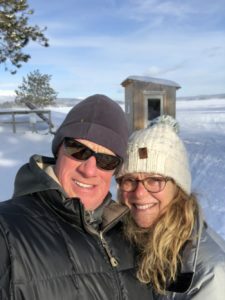 Cross Country Skiing – NEOC has a fully developed 17-mile X-country ski trail system which was beautifully groomed on the day of our ski. We took the 1.7 -mile Lake Loop, a beautiful ski with enough ups and downs to be interesting and a good workout. When we returned to the base camp, a large group of skiers were gliding across Millinocket Lake at the foot of Katahdin, appearing like the cover of an LL Bean catalogue. The Snowmobiling. Millinocket has long been a mecca for snowmobiling. And NEOC gives those riders a welcoming and comfortable place to eat and stay. Riders come from across New England to ride the endless scenic trails of the Katahdin region. They come in all ages and sizes. My 12-year-old daughter and her friend even jumped on a snowmobile for a test ride. It was my daughter’s first time on a snowmobile and she’s hooked. The Food. I won’t lie to you, we ate three amazing meals a day at the River Drivers restaurant and never considered going anyplace else to eat. The lunch and dinner menus offered nourishing, satisfying and affordable meals. We tried several of the salads, the fried haddock, the clam chowder, the burger, and the rib eye the steak sandwich. There were several more sophisticated choices, including vegetarian options, that looked delicious. But we kept it family style and simple. The breakfast was equally tasty. We tried the homemade cinnamon bread French toast, the corned beef hash, the Maine blueberry pancakes and on Sunday, we pounced on the breakfast buffet. A notable advantage of the extraordinary food is that we never felt the need to drive anywhere else, so our car never started again until it was time to go home. The Lodging. 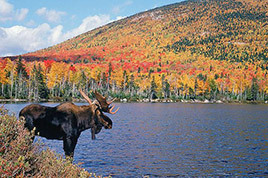 Our family stayed in Loon Cabin and considered it the most comfortable lodging anywhere in the north country of Maine. The rooms are spacious, comfortable, extremely well appointed, with full kitchens, radiant heat flooring, and exceptionally large windows that look out at the vast wilderness surroundings. We slept peacefully to the deep quiet sound of wilderness. My husband was thrilled because he could watch the football game either in the cabin and back at the restaurant, with a large crowd of football fans. Bottom Line: The Katahdin region of Maine has much to offer families seeking fun, adventure, and comfort in the wilderness. We’re big fans of downhill skiing too, but the crowds and the costs can get bothersome. After 3 days at NEOC, we’re rethinking our winter plans.